Glory in a Camel's Eye (also known as Valley of the Casbahs) is a beautifully written account of Tayler's arduous trek with Ruhhal Bedouin in 2001 on foot and camel through the Draa Valley in South East Morocco. A book conjuring up wonderful desert landscapes, this is a modern-day version to rival Arabian Sands which, in similar fashion to Thesiger's book, laments the lost nomadic life of the Bedouin. Fifteen years prior, Tayler comes across two books dealing with the radical changes occurring in the Arab world and which would forever change his life. The first was Arabian Sands by Wilfred Thesiger. The second was the lesser known, The History of the Arabs by Philip K. Hitti which detailed Arab civilisation since the 7th century and from whom he learned that the Bedouin were also co-originators of Islamic civilisation. These books fostered a desire to learn more of the Arab culture and which resulted in Tayler taking a 2-year assignment with the Peace Corps in Marrakesh in 1988. During his volunteering, Tayler hears of a wondrous valley in the south of Morocco called the Draa - a no mans land in the Sahara yet to be fully modernised or corrupted. Having once served as one of the main caravan routes for transporting ivory, gold and slaves between Europe and Timbuktu - the last of which crossed the Sahara in the 1950's - Tayler is constantly drawn to exploring this infrequently visited part of Morocco. Tayler's journey begins in Tizgui travelling through Zagora and then onto the "point of no return" at Mhamid. From here he faces the Cul du Draa furnace as he treks towards Tan-Tan on the Atlantic - all told, a journey of more than 700 kilometres. When contemplating this journey, what definitely would've been useful was a map, which sadly was lacking. Glory in a Camel's Eye renders a true depiction of travelling through areas as an outsider and one where he is constantly referred to as a Nasrani or Christian. In addition to highlighting the importance of Islam to the region, Tayler also covers off other important themes, such as how the population aren't necessarily viewed as citizens but as subjects of the King and therefore education isn't desired for them and the Berber versus Arab conflict that still exists today. But mostly, this is a book about landscapes and culture. One where Tayler writes poetically of oases, desert massfis, wadis and hamadas and knowledgeably of its sharifs, marabouts, zawiyas, qsars and jinns. We also get the benefit of Tayler's fluency in Arabic and from the numerous prior trips and time that he has spent in the Maghreb - the land of sunset. 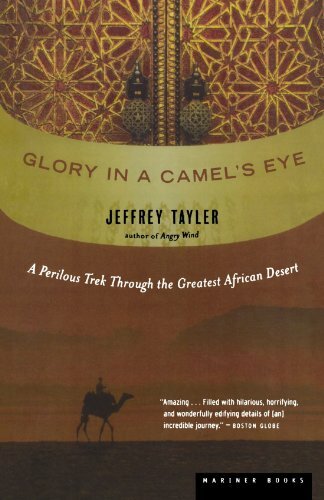 Glory in a Camel's Eye is a good book where the teachings are much more about the places through which Tayler journeys through, rather than about himself. Magically conjuring up a desert world of infinite sand dunes, campsite fires, tasty duwaz (stews) and starlit skies only disturbed by the far off snorting of camels, this is a perfect book to enjoy over endless cups of mint tea.